^ Territories and Dependencies of Mauritius include Rodrigues, Agalega Islands and Tromelin. 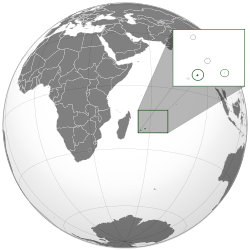 Mauritius claim sovereignty over the Chagos Archipelago known as the British Indian Ocean Territory. ↑ "Language". Government of mauritius. Retrieved 4 January 2012. ↑ Ministry of Finance & Economic Development (2011). Population and Vital Statistics - Republic of Mauritius, January - June 2011. 1 July 2011. Government of Mauritius. http://www.gov.mu/portal/goc/cso/ei919/toc.htm. Retrieved 15 November 2011. ↑ ४.० ४.१ ४.२ ४.३ "Mauritius". International Monetary Fund. Retrieved 19 April 2012. ↑ "Human Development Report 2011 - Human development statistical annex". HDRO (Human Development Report Office) United Nations Development Programme. pp. 127–130. Retrieved 16 April 2012.